Culture consists of the social behaviour and norms found in human societies and transmitted through social learning. Cultural universals in all human societies include expressive forms like art, music, dance, ritual, religion, and technologies like tool usage, cooking, shelter, and clothing. The concept of material culture covers physical expressions such as technology, architecture and art, whereas immaterial culture includes principles of social organization, mythology, philosophy, literature, and science. Anthropology has traditionally studied the roles of animals in human culture in two opposed ways: as physical resources that humans used; and as symbols or concepts through totemism and animism. More recently, anthropologists have also seen animals as participants in human social interactions. This article describes the roles played by animals in human culture, so defined, both practical and symbolic. The human population exploits a large number of animal species for food, both of domesticated livestock species in animal husbandry and, mainly at sea, by hunting wild species. Marine fish of many species, such as herring, cod, tuna, mackerel and anchovy, are caught commercially, forming an important part of the diet, including protein and fatty acids, of much of the world's population. A smaller number of species are farmed commercially, including salmon and carp. Invertebrates including cephalopods like squid and octopus; crustaceans such as prawns, crabs, and lobsters; and bivalve or gastropod molluscs such as clams, oysters, cockles, and whelks are all hunted or farmed for food. Mammals form a large part of the livestock raised for meat across the world. They include (2011) around 1.4 billion cattle, 1.2 billion sheep, 1 billion domestic pigs, and (1985) over 700 million rabbits. 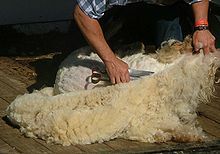 Textiles from the most utilitarian to the most luxurious are made from animal fibres such as wool, camel hair, angora, cashmere, and mohair. Hunter-gatherers have used animal sinews as lashings and bindings. Leather from cattle, pigs and other species is widely used to make shoes, handbags, belts and many other items. Animals have been hunted and farmed for their fur, to make items such as coats and hats, again ranging from simply warm and practical to the most elegant and expensive. Dyestuffs including carmine (cochineal), shellac, and kermes have been made from the bodies of insects. In classical times, Tyrian purple was extracted from sea snails such as Stramonita haemastoma (Muricidae) for the clothing of royalty, as recorded by Aristotle and Pliny the Elder. Working domestic animals including cattle, horses, yaks, camels, and elephants have been used for work and transport from the origins of agriculture, their numbers declining with the arrival of mechanised transport and agricultural machinery. In 2004 they still provided some 80% of the power for the mainly small farms in the third world, and some 20% of the world's transport, again mainly in rural areas. In mountainous regions unsuitable for wheeled vehicles, pack animals continue to transport goods. Animals such as the fruit fly Drosophila melanogaster, the zebrafish, the chicken and the house mouse, serve a major role in science as experimental models, both in fundamental biological research, such as in genetics, and in the development of new medicines, which must be tested exhaustively to demonstrate their safety. Millions of mammals, especially mice and rats, are used in experiments each year. A knockout mouse is a genetically modified mouse with an inactivated gene, replaced or disrupted with an artificial piece of DNA. They enable the study of sequenced genes whose functions are unknown. The tunicate Ecteinascidia turbinata yields the anti-cancer drug Yondelis. Vaccines have been made using animals since their discovery by Edward Jenner in the 18th century. He noted that inoculation with live cowpox afforded protection against the more dangerous smallpox. In the 19th century, Louis Pasteur developed an attenuated (weakened) vaccine for rabies. In the 20th century, vaccines for the viral diseases mumps and polio were developed using animal cells grown in vitro. An increasing variety of drugs are based on toxins and other molecules of animal origin. The cancer drug Yondelis was isolated from the tunicate Ecteinascidia turbinata. One of dozens of toxins made by the deadly cone snail Conus geographus is used as Prialt in pain relief. 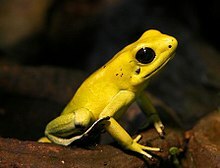 A poison dart frog, Phyllobates terribilis, secretes toxins powerful enough to be used to tip blowpipe darts. Animals, and products made from them, are used to assist in hunting. People have used hunting dogs to help chase down animals such as deer, wolves, and foxes; birds of prey from eagles to small falcons are used in falconry, hunting birds or mammals; and tethered cormorants have been used to catch fish. Dendrobatid poison dart frogs, especially those in the genus Phyllobates, secrete toxins such as Pumiliotoxin 251D and Allopumiliotoxin 267A powerful enough to be used to poison the tips of blowpipe darts. A wide variety of animals are kept as pets, from invertebrates such as tarantulas and octopuses, insects including praying mantises, reptiles such as snakes and chameleons, and birds including canaries, parakeets and parrots all finding a place. Anthropomorphism is the innate tendency to attribute human traits, emotions, and intentions to animals, and it is an important aspect of the way that people relate to animals such as pets. However, mammals are the most popular pets in the Western world, with the most kept species being dogs, cats, and rabbits. For example, in America in 2012 there were some 78 million dogs, 86 million cats, and 3.5 million rabbits. There is a tension between the role of animals as companions to humans, and their existence as individuals with rights of their own. A wide variety of both terrestrial and aquatic animals are hunted for sport. The aquatic animals most often hunted for sport are fish, including many species from large marine predators such as sharks and tuna, to freshwater fish such as trout and carp. Birds such as partridges, pheasants and ducks, and mammals such as deer and wild boar, are among the terrestrial game animals most often hunted for sport and for food. Animals, often mammals but including fish and insects among other groups, have been the subjects of art from the earliest times, both historical, as in Ancient Egypt, and prehistoric, as in the cave paintings at Lascaux and other sites in the Dordogne, France and elsewhere. Major animal paintings include Albrecht Dürer's 1515 The Rhinoceros, and George Stubbs's c. 1762 horse portrait Whistlejacket. Animals as varied as bees, beetles, mice, foxes, crocodiles and elephants play a wide variety of roles in literature and film, from Aesop's Fables of the classical era to Rudyard Kipling's Just So Stories and Beatrix Potter's "little books" starting with the 1901 Tale of Peter Rabbit. A genre of films has been based on oversized insects, including the pioneering 1954 Them!, featuring giant ants mutated by radiation, and the 1957 The Deadly Mantis. Birds have occasionally featured in film, as in Alfred Hitchcock's 1963 The Birds, loosely based on Daphne du Maurier's story of the same name, which tells the tale of sudden attacks on people by violent flocks of birds. Ken Loach's admired 1969 Kes, based on Barry Hines's 1968 novel A Kestrel for a Knave, tells a story of a boy coming of age by training a kestrel. Animals including many insects and mammals feature in mythology and religion. Among the insects, in both Japan and Europe, as far back as ancient Greece and Rome, a butterfly was seen as the personification of a person's soul, both while they were alive and after their death. The scarab beetle was sacred in ancient Egypt, while the praying mantis was considered a god in southern African Khoi and San tradition for its praying posture. Among the mammals, cattle, deer, horses, lions, bats bears, and wolves (including werewolves), are the subjects of myths and worship. Reptiles too, such as the crocodile, have been worshipped as gods in cultures including ancient Egypt and Hinduism. Of the twelve signs of the Western zodiac, six, namely Aries (ram), Taurus (bull), Cancer (crab), Leo (lion), Scorpio (scorpion), and Pisces (fish) are animals, while two others, Sagittarius (horse/man) and Capricorn (fish/goat) are hybrid animals; the name zodiac indeed means a circle of animals. All twelve signs of the Chinese zodiac are animals. ^ White, Thomas; Candea, Matei; Lazar, Sian; Robbins, Joel; Sanchez, Andrew; Stasch, Rupert (2018-05-23). Stein, Felix; Candea, Matei; Diemberger, Hildegard (eds.). "Animals". Cambridge Encyclopedia of Anthropology. doi:10.29164/18animals. ^ Fudge, Erica (2002). Animal. Reaktion. ISBN 978-1-86189-134-1. ^ "The Purpose of Humanimalia". De Pauw University. Retrieved 12 September 2018. animal/human interfaces have been a neglected area of research, given the ubiquity of animals in human culture and history, and the dramatic change in our material relationships since the rise of agribusiness farming and pharmacological research, genetic experimentation, and the erosion of animal habitats. ^ "Shellfish climbs up the popularity ladder". HighBeam Research. Archived from the original on 5 November 2012. Retrieved 8 July 2016. ^ Barber, E. J. W. (1991). Prehistoric Textiles. Princeton University Press. pp. 230–231. ISBN 978-0-691-00224-8. ^ Goodwin, Jill (1982). A Dyer's Manual. Pelham. ISBN 978-0-7207-1327-5. ^ Schoeser, Mary (2007). Silk. Yale University Press. pp. 118, 121, 248. ISBN 978-0-300-11741-7. ^ Munro, John H. (2007). Netherton, Robin; Owen-Crocker, Gale R. (eds.). The Anti-Red Shift – To the Dark Side: Colour Changes in Flemish Luxury Woollens, 1300–1500. Medieval Clothing and Textiles. 3. Boydell Press. pp. 56–57. ISBN 978-1-84383-291-1. ^ Beaumont, Peter (5 December 2016). "Ancient shellfish used for purple dye vanishes from eastern Med". BBC. Retrieved 6 December 2016. ^ Doke, Sonali K.; Dhawale, Shashikant C. (July 2015). "Alternatives to animal testing: A review". Saudi Pharmaceutical Journal. 23 (3): 223–229. doi:10.1016/j.jsps.2013.11.002. PMC 4475840. PMID 26106269. ^ Wilks, Sarah (2008). Seeking Environmental Justice. Rodopi. p. 211. ISBN 978-90-420-2378-9. ^ "The World's Top 100 Game Fish". Sport Fishing Magazine. Retrieved 8 July 2016. ^ "Fish species for recreational fishing". Slovenia.info. Retrieved 8 July 2016. ^ Thompson, David (2008). 'Have You Seen ... ?' A Personal introduction to 1,000 Films. Knopf. p. 97. ISBN 978-0-375-71134-3. ^ a b "Kes (1969)". British Film Institute. Retrieved 22 April 2016. ^ "Butterfly". Encyclopedia of Diderot and D'Alembert. Retrieved 10 July 2016. ^ Ben-Tor, Daphna (1989). Scarabs, A Reflection of Ancient Egypt. Jerusalem. p. 8. ISBN 978-965-278-083-6. ^ Biswas, Soutik. "Why the humble cow is India's most polarising animal". BBC. Retrieved 9 July 2016. ^ Grant, Gilbert S. "Kingdom of Tonga: Safe Haven for Flying Foxes". Batcon.org. Retrieved 2013-06-24. ^ "Aztec Symbols". Aztec-history.net. Retrieved 24 June 2013. ^ "Artists Inspired by Oaxaca Folklore Myths and Legends". Oaxacanwoodcarving.com. Retrieved 24 June 2013. ^ Harris, Catherine C. "Egypt: The Crocodile God, Sobek". Tour Egypt. ^ Rodrigues, Hillary. "Vedic Deities | Varuna". Mahavidya. Retrieved 19 January 2018. ^ Bhattacharji, Sukumari (1970). The Indian Theogony: A Comparative Study of Indian Mythology from the Vedas to the Puranas. CUP Archive. p. 39. GGKEY:0GBP50CQXWN. ^ "The Zodiac". Western Washington University. Retrieved 12 December 2018.